Title: CSX 500 "Spirit of Grafton"
Description: # 500 sits in Conrail's Sterling Yard. Description: CSX 500 the Spirit of Grafton. This unit needed a bath! Description: CSX 500 Spirit of Grafton sitting on the ready track. Description: The Spirit of Grafton provides the anchor on the rear of train Q316 as it descends Cheat River Grade. Description: 8:30pm finds an empty grain train leaving hinton westbound, with a non-flashing FRED. Description: G894-13 comes east at Westham with the Spirit of Grafton trailing. Description: CSX Q365-03, with the Spirit of Grafton leading the way. Description: CSXT 500 is seen in Dothan on an empty Conrad Yelvington rock train that is returning from Panama City and is back on home rails shoving into the CSX yard. Description: Close up of CSXT 500 seen in Dothan on an empty Conrad Yelvington rock train that is returning from Panama City and is back on home rails shoving into the CSX yard. Description: The Spirt of Grafton leads on autorack train along the C&O canal. Description: The Spirit of Grafton comes in on Q-471. Description: Spirit of Grafton leads an eastbound coal train. Title: CSXT 500, ICE's Mason City Sub. Description: ICE Train 579. 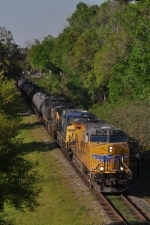 CSXT-500,DM&E-6088, Citx-2796. Description: CP unit ethonal train 666 goes off into the distance just outside of Windsor ON. Description: CP unit ethonal train 666 flies past Banwell rd jut outside of Windsor. Description: 2nd unit of CP ethonal train 666. Description: Not the best lighting, but CSX #500 Spirit of Grafton leads Q534 north at Gaithers.